Click trick name to show detail. *Some tricks are not linked yet. Welcome To The World of Skateboarding!!! This website is made for those of you who are in the early stages of pursuing your interest in skateboarding! It is intended to teach you the very basics of skateboarding before the more technical and stylistic elements of skateboarding come into play. Specifically, this section hopes to impart on you a familiarity with what you should try to learn before you get to what is arguably the most important trick of them all, the ‘ollie’. 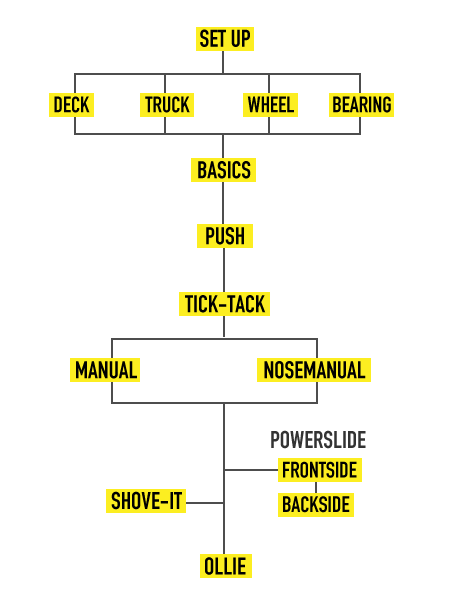 These basics include information about the components of the board itself, as well as the simple maneuvers of pushing, tick-tacking, manualing, power sliding (this ones actually not so easy! ), and ‘shoving’ your skateboard. We recommend learning the maneuvers listed above in that order. Please take a look at the guide below for more detailed information as well as further links on each of them. The basics as listed above will often times take anywhere from a few weeks to a few months to get comfortable with, so don’t feel like you’re in any rush. Enjoy the basics! *This content is under-construction so some part is missing. 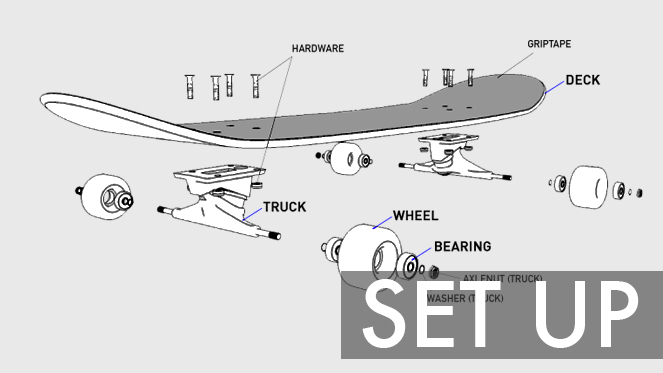 The ‘parts’ of a skateboard consist of the ‘deck’, the ‘trucks’, the ‘wheels’, and the ‘bearings’. All parts come in a variety of specifications, including shape, size, softness, and flex. As each specification is geared toward a specific purpose, you should take advantage if you can of the option to customize your own setup in accordance with how it is you want to skate. You can ask someone working at a skate shop for help, or you can set your skateboard up yourself. Here are some links to the information you should have to help you choose your own preferred type of setup (The final SETUP link will show you how you connect each gears to make skateboard)! You’ve got your brand new (or your newly inherited hideous hand-me-down) skateboard and you’re ready to go for your first ride. Congratulations! Before you get to it, you should learn some basic motions and practice them for your safety. It is very dangerous to ride a skateboard without knowing how to do so. So please, read the article below and get ready to enjoy your first ride! Obviously this part is similar with parts of the link that are available above, but you will need to learn how to push repeatedly and while in motion to achieve higher and higher levels of speed. In the previous section you practiced a single push. This time, practice as many pushes as the space you have in front of you will allow. Once you get comfortable with moving while on your skateboard as well as with increasing speeds, the next maneuver which is worth your while to learn is a trick called “tick-tacking.” So long as you have developed a comfortable sense of balance while standing and moving on your skateboard, the tick-tack should come quite naturally and easily to you. It’s a great way to further improve your sense of balance and agility while you are on your skateboard. *Keep in mind that, while it may be slightly more dangerous and necessitating an even greater sense of caution and care, you can practice your skating down gentle slopes as well as a variety of flat grounds. Navigating gentle downward slopes helps to improve your skills and is really quite fun. So long as you do not feel like you are putting yourself or others around you in danger or disrespect, think creatively and turn whatever surface you can into a spot to skate! Once you jedi-master the tick-tack, try manual-ing next. A manual is a maneuver in which you balance yourself on only one of either the front or back set of wheels. It is one of the best exercises to improve your balance on your skateboard. It can take quite a long time to become familiar enough with the manual to be able to do so over long stretches of distance, so start with small goals! The nose-manual is the opposite of the tail-manual. The idea is the same, with slight adjustments required of you in terms of how you balance yourself during the maneuver. The F/S power slide is a trick that forcefully turns your board 90 degrees, your body turning forward as it slides. The trick can be used for controlling speeds while going downhill, and it is also a basis of sorts for slide tricks done on boxes, ledges, and bowls. This maneuver can actually be quite terrifying as it requires a certain amount of speed to be able to do in the first place, and if your balance and weight distribution is off you can almost go flying off your board. Stay low when you commit to the slide, keeping your center of gravity low to the ground! With a B/S powerslide your body turns and faces backward as it slides. If already you’ve gotten familiar and comfortable performing the maneuvers listed above, skateboarding should already be providing you with a not-too-shabby sense of thrill, enjoyment, challenge, and satisfaction! Well, get ready to enjoy learning and landing a shove-it! 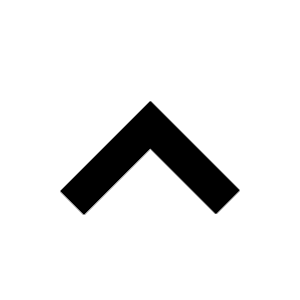 A ‘shove-it’ is a simple maneuver in which you spin your board 180 degrees underfoot. While it’s the easiest rotational trick in skateboarding, since you’re just getting started it may very well take some time to get it down. It usually takes a few hours to a few days to start landing shove-its with a relative consistency. *Powerslides and shove-its are not as necessary to learning how to ollie as the maneuvers mentioned higher up above, so if you really want to learn the ollie without getting comfortable with powerslides and shove-its, you may go ahead and start practicing after getting used to doing manuals. Even if you skate everyday, from scratch it usually takes a matter of weeks to months to really get comfortable with all the maneuvers listed above. Natural talent (keep trying, even if you seem to have absolutely zero-nothing-nada!) and dedication often dictate the differing speeds at which people new to skating gain basic skateboarding proficiency, and this next basic trick might still keep you at it for a fair amount of time to come! The ollie is an absolutely essential trick to skateboarding. Once you get comfortable with the ollie, that’s really when a completely new world of skateboarding will start opening up to you. We wish you nothing but the best going forward!